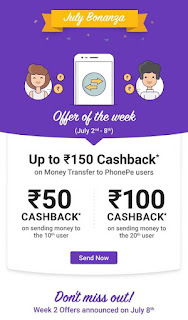 * Send Rs.100 Minimum to 20 Other PhonePe User and Get Rs.150 Cashback in PhonePe wallet. * Offers Duration 2 July to 8 July. 3- Link your Bank Account with PhonePe App. 4- Now Create VPA With Phonepe App. 6- Pay the amount only with UPI by Bank. 7- After Complete 10 Txn. Yoi will Get Rs.50 in Your Phone Pe Wallet in 24 hrs. 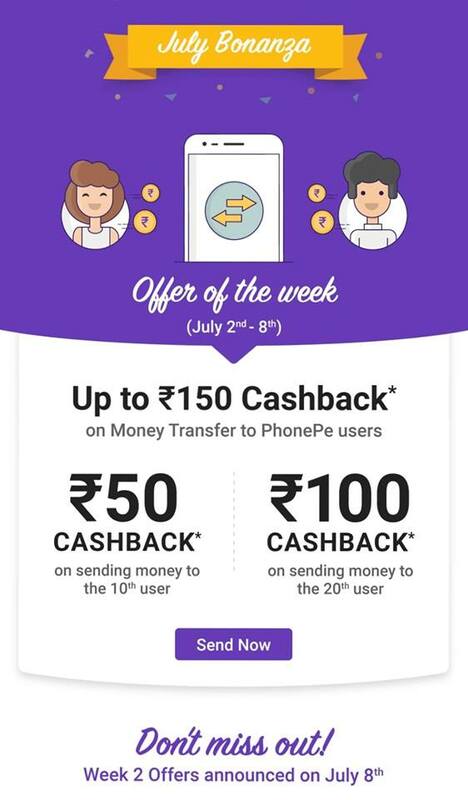 8- In Same Week (2 to 8 July) If You Send ₹ 100 Minimum To 20 Different PhonePe Users , You Will Get ₹ 100 Extra Cashback. 9- Cashback Will Be Credited After Sending Mony To Different Phonepe Users. 10- Complete this two offers or Done 20 Different Txn. and Get Rs.150 Cashback in In this Week. 1- Send Rs. 100 Minimum To Different Friends & Get Rs. 50 Free. Send Rs. 100 Minimum To Twenty Different Users & Get Rs. 100 Extra Free. 3- Cashback Will be Credited to the PhonePe Wallet Within 24 Hrs. 4- Offer Valid From 2 Ju ly 2018 12:00 Am Till 8 July 2018 23:59 Hours. 5- Offer Valid On Minimum 10 Transaction per PhonePe Registered User/SmartPhone During the Offer Period and applicable for both Android and IOS Devices. 6- The transaction Must be initiated and completed by the user within the PhonePe app. 7- PhonePe has the Right to amend the Terms & Conditions, and end the offer, or Call Back any or all its offer without prior notice.